Three NDNA member nurseries in Dubai have been awarded National Day Nurseries Association’s e-Quality Counts. This two year programme is the only quality improvement scheme designed specifically for nurseries, promoting the highest levels of childcare and early education. It enables nurseries to review quality and practice against a set of early years best practice standards. NDNA’s Chief Executive, Purnima Tanuku OBE, said: “To be awarded with e-Quality Counts, nurseries must show they are giving the highest levels of care and education and are leading the way in early years excellence. “This is what parents are looking for and is a very effective way to stand out from your competitors. 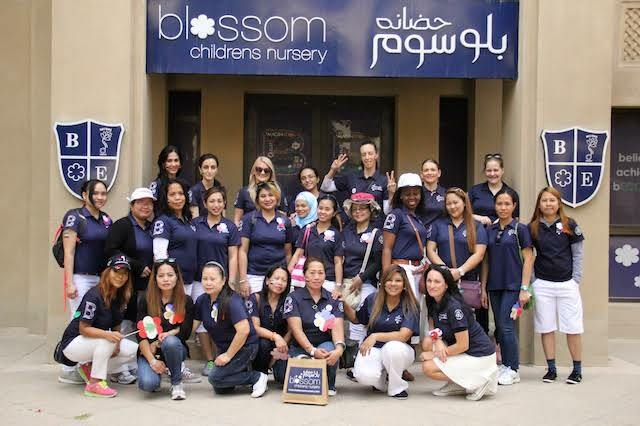 Blossom Downtown Nursery in Dubai was the first international member to achieve the award, taking just 14 months to complete the 12 challenging compulsory modules. Tamara Stubbs, Centre Director is convinced that gaining the award helped to improve standards of care and education throughout the group’s six settings. She said: “I thoroughly enjoyed completing the NDNA e-Quality Counts accreditation. I was able to reflect on current practice alongside my team and evaluate the areas we are strong in and the areas that needed some improvement. The Blossom Nursery employs more than 200 staff members and also takes part in NDNA’s Maths Champions programme. Willow Children’s Nursery in the city completed its award in June 2016 alongside a major expansion of the business. Jan Webber who is the Founder and Partner of Willow Children’s Nurseries is convinced that her team gained knowledge and were brought closer together as a result of participating in the scheme. She said: “Owning a nursery in Dubai has its challenges. Regulations and requirements differ somewhat from the UK and in the last five years the demand for nurseries has quadrupled! “We embraced the challenge and, working as a team, we began to see areas that definitely needed development or improving. The e-Quality Counts scheme helped us to see where we needed to take our setting to become a better place as a whole. “We reflected on our practice, reviewed our policies and scrutinised our operational systems. Looking at the expectations we were able to devise a plan of action to implement new procedures that we did not have in place previously. Aga Khan Early Learning Centre is Dubai’s third nursery to earn the e-Quality Counts award. The centre’s Head of Nursery and Preschool, Kelli Allen, was thrilled to achieve the highest level of accreditation. She said: “The Aga Khan Early Learning Centre (AKELC) is proud to have achieved the UK National Day Nursery Association Level 3 accreditation. Overall, the extensive NDNA review process was comprehensive and extremely professional. “This award recognises the highest level of achievement and serves to validate the AKELC status as an exemplary nursery and preschool, based on internationally recognised criteria of quality indicators and standards of excellence in early childhood care and educational practice. Any nursery achieving e-Quality Counts retains the quality mark for three years before needing to be re-inspected. NDNA International currently has 127 members in 22 countries, from Spain to Singapore, with 23 in the United Arab Emirates. An event to showcase NDNA’s work around the globe is taking place in Dubai in spring 2017. This will be followed by an organised visit of international practitioners and managers to outstanding English nurseries.